I used to snorkel and scuba dive a lot when I was younger, and though I can’t physically do that anymore, the memories remain and on occasion trigger a poem. Perhaps because I had just written a “food poem” for the March 24 Tupelo Press 30/30 Project, called “It’s Just a Salad,” food was on my mind and must have intersected my reminiscences of an octopus experience in Big Pine Key way back in the late 70’s. I was on a diving trip, but on that particular evening at the campground by the inlet cove, I was walking the rocks at the water’s edge looking for interesting marine life when I spotted an octopus. These incredible invertebrates can not only change color, but texture too. The only reason I spotted it was because it was changing its position. 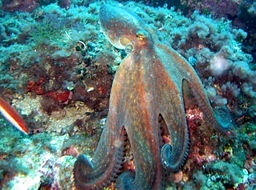 That encounter conjured memories of my grandfather and his escapades with a much larger octopus in Sicily. Now this might sound weird to you, but octopus is one of the best seafood I have ever eaten. And I knew how to cook it so that it would remain tender. Afterwards, the tender morsels would be dunked into a freshly macerated garlic and minced parsley in olive oil and lemon juice. So I was determined to capture that octopus. And I did. The poem describes some of the details. Quatrains seemed to fit as the natural form. The poem heads in that direction, but the reader is unaware of the culinary intent of the narrator. Notice the deliberate pronoun ambiguity in the last line. The “it” would correctly refer to both the color of the water and that of the cooked octopus. The line breaks are not remarkable, but it’s the imagery that carries this poem.